The European elections in Greece were held under conditions of austerity , mass unemployment , people’s misery and enhanced national dependence on the imperialist centers and multinationals. In this election , abstention remained stable at a high percentage (over 42 %) . The accumulated resentment , social protest and anger against government policies and government parties (ND : 22.7 % , PASOK : 8% , etc) expressed in electoral victory of SYRIZA (26.5 %). But this victory was neither a corresponding mass social protest or sweeping. SYRIZA supported and supports the policy of theory of “a better EU nations ” and thus initiated and election . The party of “K” KE got low percentages (6.1 %) confirming the deadlocks of it general disruptive and decadent presence. Particularly worrying is the stabilization of the nazi-fascist Gold Dawn, which got a significant proportion (9.4 % ) and became the third party of these elections. It should be noted and appreciated that politically; due to the line of compromise and sectarianism of the ” left ” parties essentially not entered strongly in the election process the central problem of Greece: the enhanced dependence on the imperialist centers : the EU, the Eurozone and the euro . 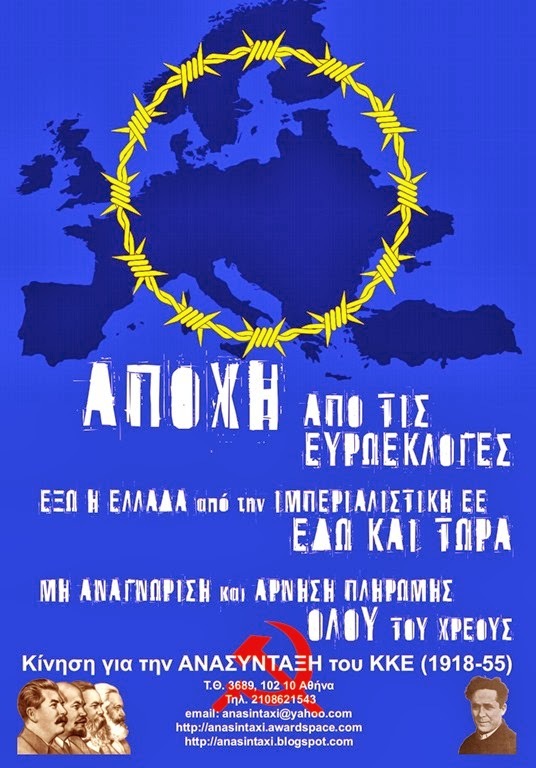 The Movement for the Reorganization of the Communist Party (1918-1955) called for a boycott of the elections simultaneously displaying the slogan of DIRECT WITHDRAWAL of Greece from Euro – EMU -EU emphasizing the struggle against imperialist dependence, fascism , racism and nationalism.